Anki announces fully autonomous, cloud-connected, and always-on home robot, the Vector. Consumer robotics and artificial intelligence (A.I.) company Anki today announces Vector, its first home robot with personality. Vector is a fully autonomous, cloud-connected, and always-on home robot. Vector features high-res color IPS display. With around a thousand animations in Vector, he reacts to his environment in a way that's not only full of personality but also meaningful. He even responds to human touch, thanks to the capacitive touch sensor built on his back. Vector is fully autonomous, cloud-connected, and always-on. While he is deceptively smart out of the box, he'll only become smarter over time thanks to over-the-air (OTA) updates. Vector's got his head in the clouds, but that doesn't mean he's living in a fantasy world. Tapping into the Ask Vector feature, he'll provide instant answers to factual questions about real world people, places, and things. Vector is more than just a robot sidekick. He can help you become more productive by helping out with simple tasks. Ask him for the weather before you head out for the day and he will answer in his own, charming way. Cooking dinner? Setting a timer with Vector means no more overcooked meals in your future. You can even ask him to take a picture and he will intelligently frame the shot by recognizing the faces in it. And just because Vector is a helpful robot doesn't mean he can't also have a little bit of fun. You can prompt him to play a game of Blackjack and he'll even use his accessory Cube to play a handful of games with you. If he hears music, he may even dance to the beat. + Vector's brain is built on a Qualcomm Technologies' 200 platform which provides the connectivity, computing, camera, and on-device A.I. capabilities that Vector needs to be smart, approachable, and autonomous - without having to be tethered to a phone or requiring a permanent cloud connection. 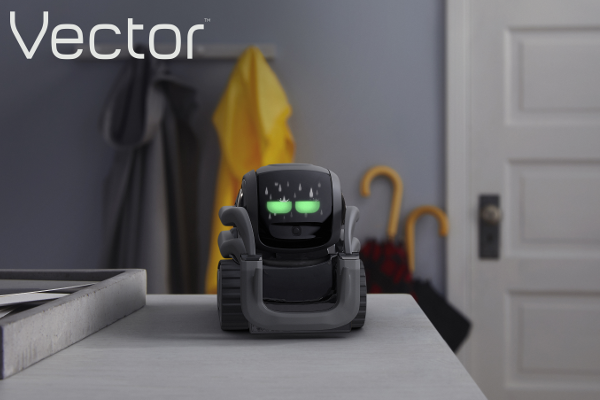 + Vector is outfitted with an HD camera with 120° ultra-wide field of view that allows him to see the world, recognize people in the room, as well as learn the names of people he sees. + Vector uses an array of four microphones to hear and detect commands from you and your family and friends around the home. Just say "hey Vector" to get his attention and voice a command. + Vector already knows his limits. When he's feeling tired or low on energy, he can locate and roll back to his charger. He is also equipped with four cliff sensors, which are infrared (I.R.) emitters situated under the corners and there to prevent Vector from falling off edges. + Vector was designed with security and privacy in mind. Anki developed and incorporated security features that strengthen robot security and minimize data collection for privacy, so you can have a safe and secure experience when interacting with Vector. We care about user privacy, and do not store voice or audio in the cloud. Vector can be purchased via pre-order on Kickstarter starting today. The 30-day campaign will end on September 6. Backers of the project will receive Vector at a special Kickstarter price and early access to the robot as well as the software development kit (SDK) alpha, which is launching this winter. Backers of Vector are also automatically enrolled in the Vector Insiders Club, a Kickstarter-exclusive group that will help shape the future development roadmap for Vector. In October, Vector owners will also be able to purchase a Vector Space (MSRP: $29.99). The Vector Space is Vector's home within your home and gives him a perch to observe any room and the perfect stage to perform. Vector is available for preorder in the U.S. starting today on Kickstarter and backers will have early access to their robot on October 9, in addition to receiving a special Kickstarter price and various exclusive backer rewards. Vector will be in stores on October 12.